This Butternut Squash Soup is a Martha Stewart recipe that is absolutely wonderful. The soup is creamy and quite filling so make sure you don’t have it with anything heavy. I served it with a Pear and Walnut Salad. Since we had leftovers of this soup, I froze it and it tasted just as good the second time around as the first time. Here are some of the ingredients you’ll need. The original recipe calls for 4 cups of water but I was afraid it would taste too watery so I used a 1/2 a quart of vegetable broth and 1/2 a quart of water. I also used cinnamon and pumpkin spice because I like the taste of those spices. The recipe also calls for 2 inches of fresh ginger but, for my taste, that was a little bit too much ginger and next time I’ll reduce it to 1 inch fresh chopped ginger. 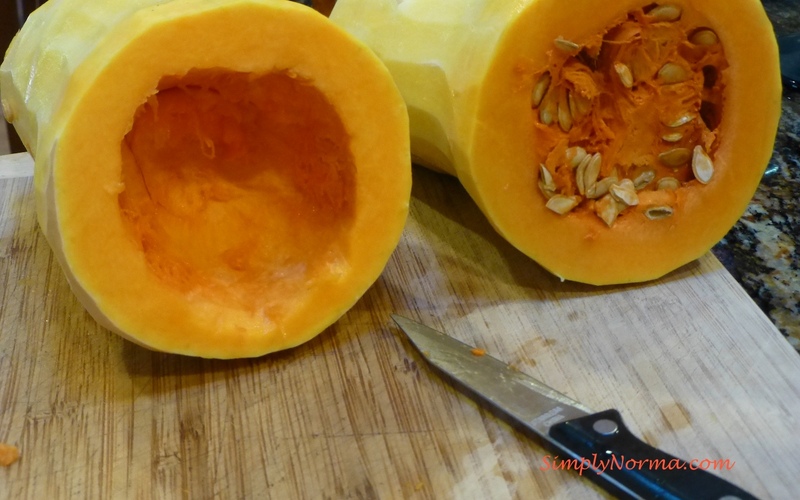 Have you ever seen the inside of these beautiful butternut squash before? 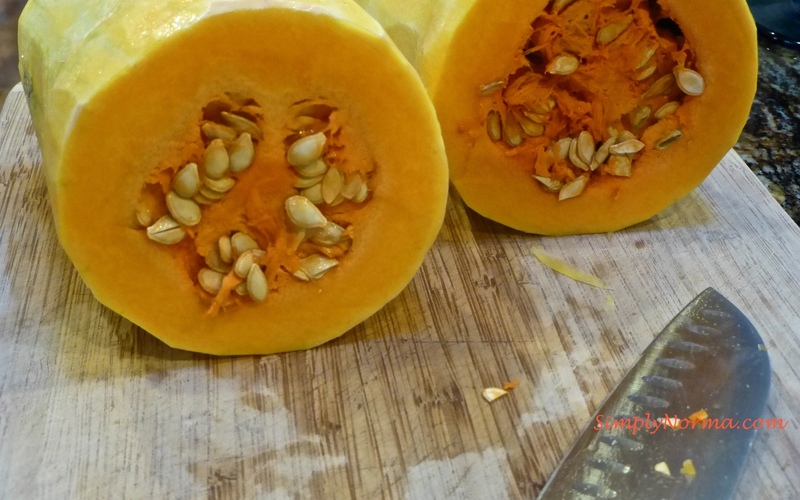 After peeling the squash and cutting off the ends, you can scoop the seeds out with a large spoon or a small knife which worked better for me. Next you’ll be slicing the squash and cutting it into bite size pieces (1 inch or so). After preparing the rest of the ingredients, you’ll be putting the squash in a large skillet and allowing the squash to soften. So far so good? 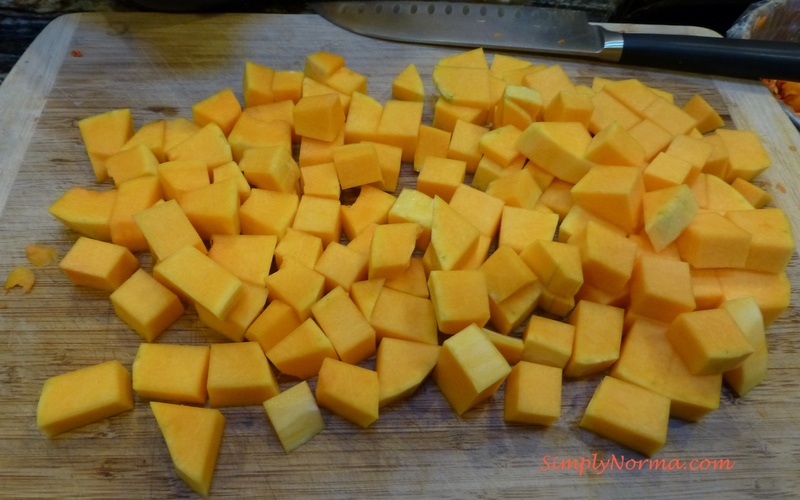 The hardest part of this recipe is peeling and cutting the squash. Ready for the recipe? Cook the onion until clear, about 2-3 minutes. Add the ginger, garlic, and squash stirring occasionally for a few minutes. Stir in the water and vegetable broth. 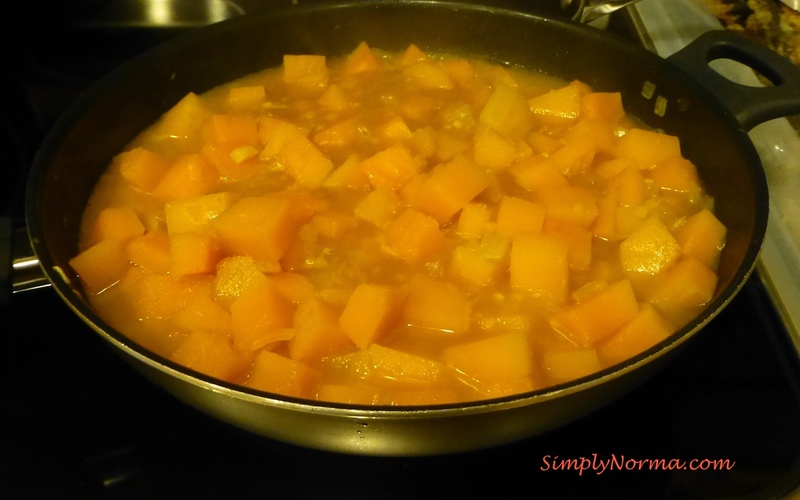 Bring to a boil then reduce the heat and simmer until the squash is tender which is anywhere from 20 to 30 minutes. 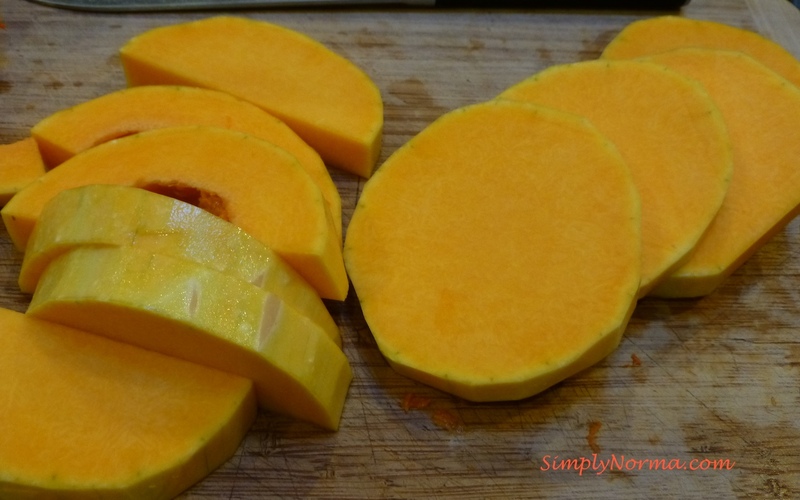 When the squash is soft (you can poke it with a fork to check it) then turn the stove top heat off. 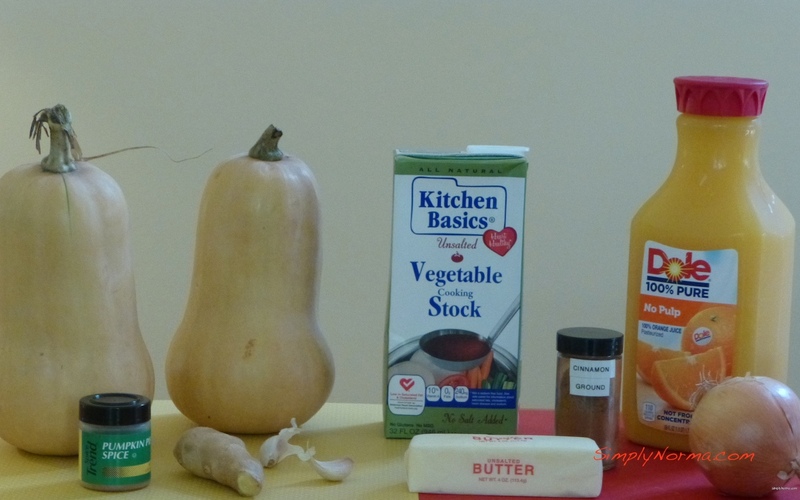 Pour 1/4 of the squash mixture into a blender and puree it. 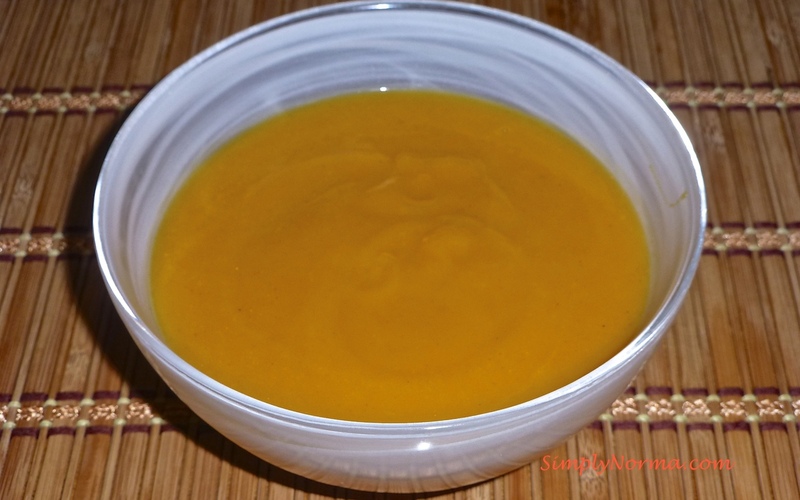 Remove the pureed soup from the blender and set it aside then pour another 1/4 squash mixture into the blender and puree. Continue doing this until all of your squash mixture is pureed. Make sure not to burn yourself while pureeing this hot soup — remove the blender cap (not the cover) and put a towel over the top of the blender. Hold the towel down as you’re pureeing. Pour all the soup into a pot and stir the orange juice into it until it’s all incorporated. Whala! You are finished and ready to eat. This soup is creamy and rich. It has the texture of cream of wheat which I love but, unfortunately, my husband does not. Enjoy! This is truly a hearty and healthy soup.